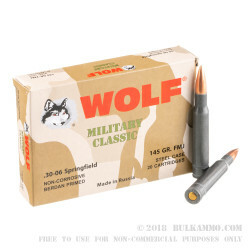 This 30-06 Springfield ammo by Wolf features provides shooters with cost-effective quality ammo for the range. 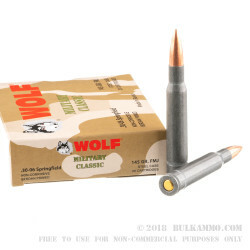 This berdan primed steel-cased ammo is coated with Wolf's proprietary polymer coating to ensure smooth feeding and extracting. Sitting atop the case is a full metal jacket bullet weighing 145 gains. 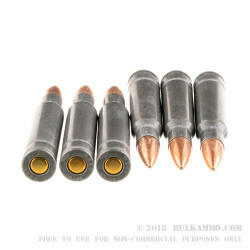 This FMJ bullet has a lead core inside a bi-metal jacket consisting of copper washed steel rather than the more traditional copper/zinc jackets seen on most brass-cased ammo. This combination helps cut out some of the cost while still giving the bullet desirable properties to ensure reliable functioning. Wolf's brand rests on the goal of bringing shooters high quality ammo at affordable prices and this Russian made ammo achieves this goal nicely. Ordered from you guys on a Thursday afternoon, you shipped the next day, and I received it the following Monday...good job. Tuned in a new scope Saturday (11-4-14) . Shot 100-rounds with NO problems.. Groups well. Some of the cleanest ammo I have shot in years. Q: Is this round safe for a 1903A3, or should I use the recommended M1Garand ammo? Thanks in advance. A: As long as your rifle is serial numbered above 800000, you will be good to go provided the rifle is in good shape. As with all of these older military rifles, we recommend that you have it checked out by a gunsmith before firing. Q: what is the velocity of these rounds ? A: John, Wolf lists the velocity of this ammunition at 2,781 fps. Q: Would this ammo be safe to use in a Remington 770? A: Hello Brooks, These 145gr. FMJ rounds by Wolf in .30-06 will fire in a Remington 770. I would personally recommend a brass cased round for a bolt action rifle however. 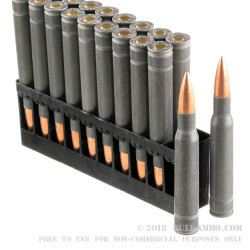 A: This 30-06 ammo from Wolf will attract a magnet. While this may prohibit use at indoor ranges, this is an excellent round for any outdoor target or hunting application. All rounds are loaded with Wolf's non corrosive components. Q: Is this WPA ammo OK in a Garand M-1? Can these cases be reloaded safely? A: For the M1 Rifle, we recommend Federal and Hornady M1-specific ammo. These Wolf steel cases cannot be reloaded. A: The difference is that the 180 grain bullet is heavier than the 145. Depending on the manufacturer, the 145gr ammo is probably faster than the 180, and will impact slightly higher at 200 yards. However, the 180 will most likely have a superior long-range trajectory.